A second New Forest attraction has been hailed as one of the nation’s best attractions. The Beaulieu attraction, home of Lord Montagu and the National Motor Museum, has been given top marks from VisitEngland which praised it for giving a full day’s visit of educational as well as entertainment value offered in an attractive historic setting which is maintained to an exceptionally high standard. The gold accolade was awarded to Beaulieu as a result of the most recent Visitor Attraction Quality Scheme audit in August. 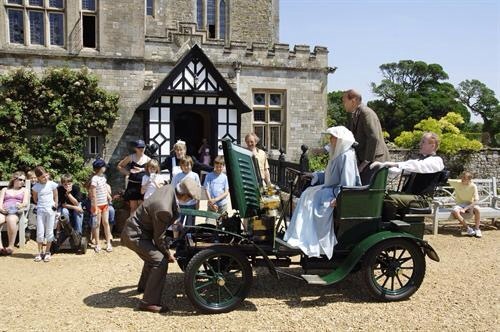 Its report concluded that Beaulieu is an outstanding visitor attraction with the many elements to its offering being individually interesting, fun and well presented; collectively adding up to a full and satisfying day out for visitors. The range of content far exceeded expectation both in variety and sheer scale, from stately home to a Top Gear experience, from an enormous car and motorbike display to an exhibition on Beaulieu’s secret role in the Second World War. Commercial Director, Stephen Munn, said: “We are delighted to receive further affirmation of the quality of the Beaulieu attraction and its staff and the level of customer care shown to our visitors, maintaining the standard that saw the attraction being given the top award in the large Visitor Attraction of the Year category at the 2013 VisitEngland Awards for Excellence. This entry was posted in National Motor Museum and tagged Beaulieu, chrismacgowan, christopher macgowan, Hampshire, Lord Montagu, New Forest, Stephen Munn. Bookmark the permalink.